Light and refreshing, this Cucumber Salad Recipe is the perfect light lunch or go-to side dish. 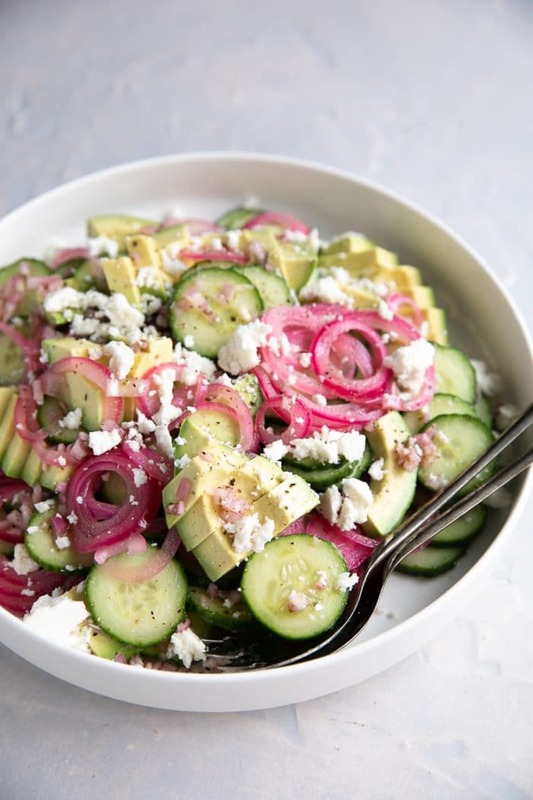 Filled with crunchy cucumbers, quick-pickled red onions, and creamy avocado, it’s easy to enjoy this healthy cucumber salad year-round with your favorite chicken, fish, or shrimp recipes! You guys, cucumbers need more love. Fresh, economical, and crazy low in calories, it’s somewhat surprising that cucumbers take the backseat in the fruit world. Yes, the cucumber is a fruit! As a result, I decided to make my version of the very best cucumber salad. 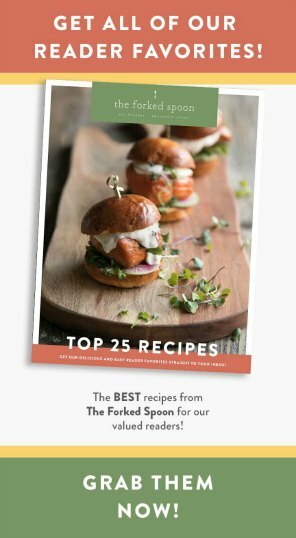 Zesty, crunchy, creamy, and FRESH, I can almost guarantee that you will love it too! And, if you’re anything like me, the cravings will soon follow. 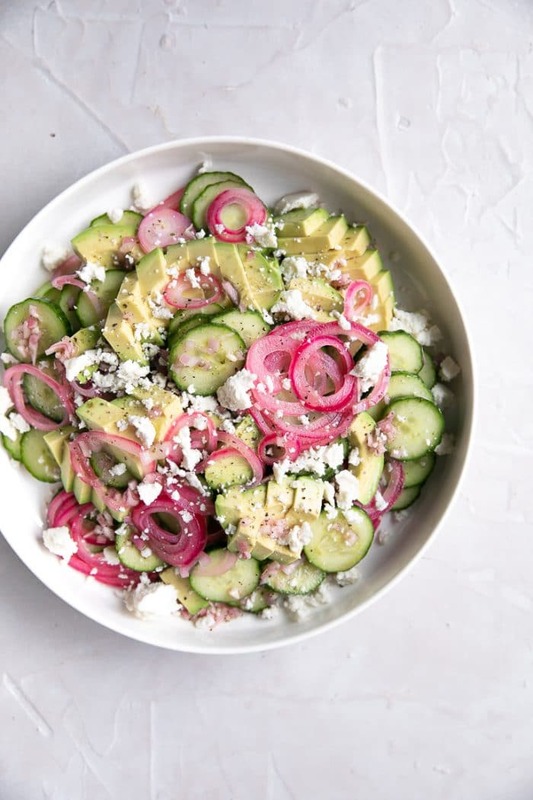 Whether you enjoy a bowl of this cucumber salad for lunch or as a side with your favorite grilled veggies, shrimp, chicken, or fish, there is no wrong way to eat more cucumbers! The variety of cucumber salads out there is…a lot. We have creamy and light cucumber salads; German, Japanese, and Greek cucumber salads; Grandma’s cucumber salad…like I said, a lot. This version is my version. 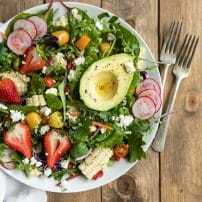 With elements of creaminess from the avocado and the Casero cheese, the rest of this salad is completely refreshing, crunchy, and zesty. The perfect balance. What type of cucumber should you use in salads? Whenever I know I will be making salads- especially cucumber salads- I will always purchase English Cucumbers. Long and narrow, English cucumbers are not waxed. Nearly always found wrapped in plastic, the skin of the English cucumber is much thinner, and thus more edible when compared to other cucumbers. English cucumbers also have smaller seeds which make them easier to eat. As a result, most people see little need to de-seed (or peel) these cucumbers. Most importantly, English cucumbers have the most favorable taste as they are less bitter, mild, and somewhat sweet. Low in calories. If a low-calorie snack is what you’re after, then you’re in luck because the cucumber comes in at just 8 calories per half cup! Promote hydration. The cucumber is made of 96% water. Loaded with nutrients. High in vitamin A, vitamin C, folic acid, fiber, magnesium, and potassium. Just remember to leave that peel on there as it’s the healthiest part! 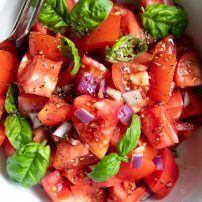 Fortunately, this salad is super easy to make and looks really pretty when put together. 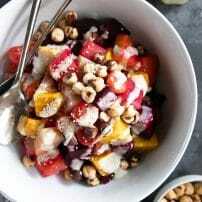 Start to finish, this salad would take you approximately 30-40 minutes to prepare. The total time is a little longer because I recommend that you pickle your own red onions. 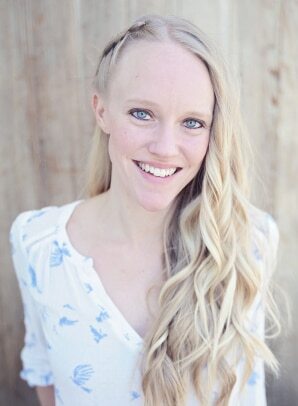 You guys, I promise it’s the easiest thing you will ever do in your whole life. It takes about 30 minutes and no fancy equipment. 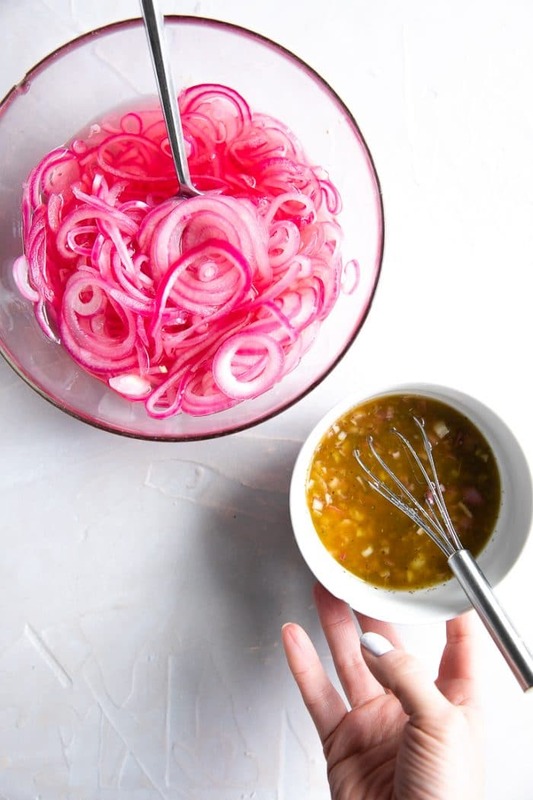 Click here to read all about how to make quick-pickled red onions. First things first, at least 30-40 minutes before you plan to assemble your cucumber salad, you want to get those onions going. While you wait for approximately 5 cups of water to come to a boil, use a mandoline slicer (if you have one) to thinly slice your onions. Once the water is boiling and the onions are sliced, transfer the onions to a wire mesh strainer and slowly pour the water over the onions. 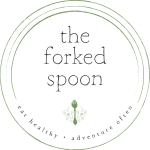 Mix the onions with the rice vinegar and a tablespoon of sugar in an appropriately sized bowl or jar and let them soak for at least 20-30 minutes. Next, I like to prepare the vinaigrette. Fortunately, this particular vinaigrette is super easy and just requires that you dump all the ingredients in a jar or bowl and mix. Season well, to taste, keeping in mind that aside from the pickled onions, the salad will be made up of just three things- the cucumbers, avocado, and cheese (if using). Now, you guys, if you’re thinking, this is too much, I just want something that I can literally throw together as soon as I get home from work, I FEEL you. You can easily prepare the quick-pickled red onions and vinaigrette ahead of time. You could even slice the cucumber ahead of time if you really wanted to make it fast. The only thing that should be sliced just before serving is the avocado. Which actually brings me to the next step in the preparation of this cucumber salad- it’s time for the final chopping. Some people like to slice their cucumbers on a mandoline, but I say avoid the risk and just use a good knife. Unless, of course, you’re really bad at slicing or you need or want super thin cucumber slices. Transfer the cucumber slices to a large bowl and toss with a couple tablespoons of the prepared vinaigrette and then transfer to a large salad bowl (or simply leave it in the mixing bowl). Add some pickled red onions (shaking off as much excess vinegar as possible) and the avocado. Mix gently with the rest of the vinaigrette and sprinkle with as much or as little Casero cheese as you’d like. 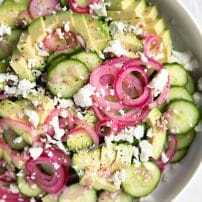 If you try making this Cucumber Salad Recipe, please leave me a comment and let me know! I always love to hear your thoughts. DON’T FORGET TO PIN AND SHARE THIS FRESH AND HEALTHY CUCUMBER SALAD AND ADD IT TO YOUR NEXT WEEKLY MEAL PLAN! 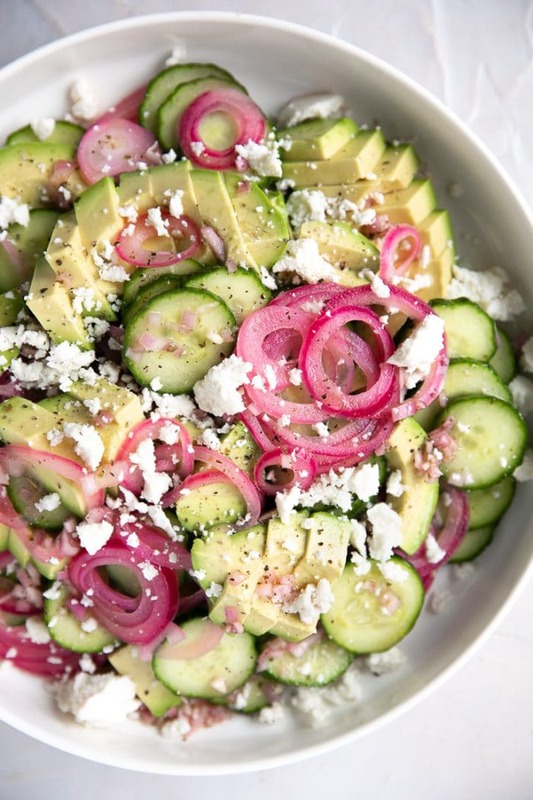 Light and refreshing, this Cucumber Salad Recipe is the perfect light lunch or go-to side dish filled with crunchy cucumbers, quick-pickled red onions, and creamy avocado. Bring approximately 5 cups of water to a boil. Meanwhile, peel and thinly slice the red onion. Mix the rice vinegar with the sugar in a medium jar or bowl. Set aside. Place the sliced onions in a fine mesh strainer and slowly pour the boiled water over the onions. Allow the water to fully drain before transferring them to the container with the vinegar. Stir gently and allow onions to rest for at least 30 minutes to overnight. Keep stored in the refrigerator until ready to use. Whisk together all ingredients for the vinaigrette in a medium bowl until fully combined. Season with additional salt, pepper, and red wine vinegar, to taste. Add the cucumbers to a large bowl and drizzle with 1-2 tablespoons of the prepared vinaigrette. Toss to combine. 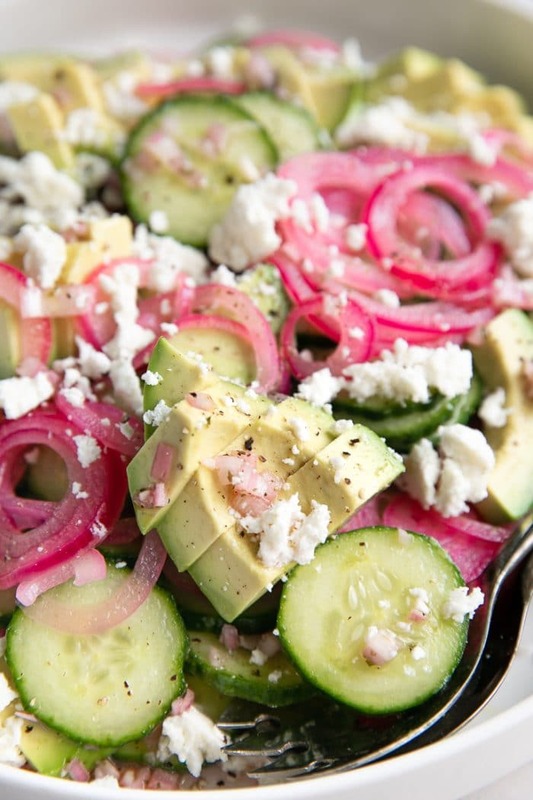 Transfer to a large salad bowl and top with the sliced avocado, pickled red onions, and additional vinaigrette. Gently toss to combine and top with crumbled Casero cheese. Season with additional salt and pepper, to taste. Enjoy! Click here to learn more about pickling red onions. You may prepare the pickled red onions up to two weeks in advance and the vinaigrette up to two days in advance. Casero cheese is my favorite cheese for this recipe given its smooth, creamy taste, but feta cheese would make an excellent substitute.